There are only three counties left with active polio cases: Pakistan (58 cases last year), Afghanistan (37 cases) and Nigeria (121 cases). This is a disease that has no cure, but can only be prevented. But alas, it seems that it may be harder to eliminate it from theses last few countries. Last month, nine polio workers, mostly women, were killed in different cities in Pakistan. The effort is back on with increased security, but one of the security policemen was killed late last month. 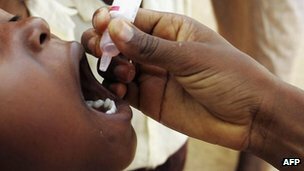 Nine female polio vaccinators have been killed in two shootings at health centres in northern Nigeria, police have told the BBC. In the first attack in Kano the polio vaccinators were shot dead by gunmen who drove up on a motor tricycle. Thirty minutes later gunmen targeted a clinic outside Kano city as the vaccinators prepared to start work. Such opposition is a major reason why Nigeria is one of just three countries where polio is still endemic. But this is believed to be the first time polio vaccinators have been attacked in the country. It is tragic for the children there and it is tragic for the workers. Especially, what have the workers done to die like that? It is suspected that Boko Haram is behind the attacks. The name of the group literally means "Western Education is Forbidden" in Hausa language. According to the Wikipedia entry on this group, they oppose man-made laws and modern science. There you have it. I have no idea, but I'm curious to know if they use any modern medicine at all - from drugs against malaria to simple antibiotics. In any case, read this polio story here. If polio vaccine prevents fertility, then yes please, Pakistanis and Nigerians need it even more badly.